The controversy over the management of national forests in the Pacific Northwest vividly demonstrates the shortcomings of existing management institutions and natural resource policies. The Wisdom of the Spotted Owl explores the American policymaking process through the case of the spotted owl -- a case that offers a striking illustration of the failure of our society to cope with long-term, science-intensive issues requiring collective choices. What caused the extreme polarization of opinion and lack of communication throughout the 1980s and early 1990s? How can the inadequate response of government agencies and the failure of the decisionmaking process be explained? What kinds of changes must be made to enable our resource policy institutions to better deal with critical environmental issues of the 1990s and beyond? By outlining a set of needed reforms, the book will assist those who are involved in re-creating natural resource agencies and public policy processes for the challenges of the next century. 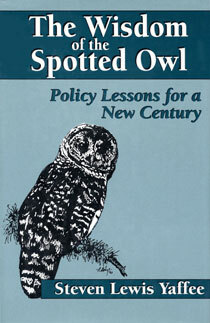 In explaining the policymaking process -- its realities and idiosyncrasies -- The Wisdom of the Spotted Owl provides a framework for understanding policies and institutions, and presents a prescription for change to allow for more effective handling of current and future environmental problems.